Harrison's organizational development analytics enables you to assess key talent functions by manager, department or the entire organization. It empowers you to build effective teams, create an engaged culture, develop behavioural competencies, and retain top talent. Harrison Team Analytics identifies the factors that help or hinder teams from achieving their objectives by identifying areas of functional diversity and dysfunctional conflict. Our Team Paradox methodology provides the common language needed to create clarity and functional diversity. Each individual team member becomes aware of the key adjustments they need to maximize team performance and work effectively with the other team members. Our engagement survey enables you to find out what really matters to your talent and discover how well their expectations are being met. 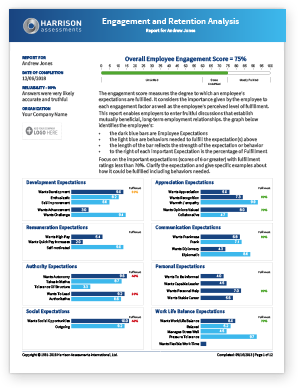 Our employee engagement survey is integrated into the SmartQuestionnaire and provides actionable data for engagement. This includes key employee expectations ranked in order, the extent to which employees believe their key expectations are being fulfilled, and the behaviours employees will need to develop to meet those expectations. If your organization already has their own behavioural competencies, our 175 Harrison traits can easily be incorporated into custom formulas that measure your employees against your competencies. 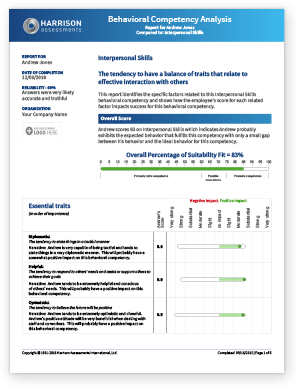 Our Behavioural Competency Reports compare an individual with the detailed success behaviours needed to become competent. You can empower your employees with development reports that target specific development areas needed to achieve a competency. 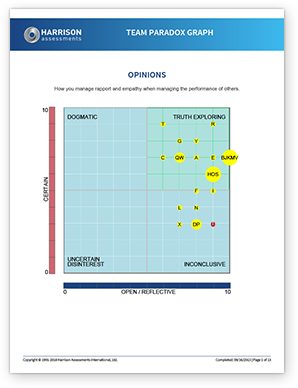 Our cultural analytics service enables you to compare your organization's actual culture to what you want it to be. Use the group insights to identify gaps between behaviours and objectives. Our Employee Turnover Analytics enable you to discover why your talent is leaving and how you can intervene to increase retention and employee satisfaction. Identify at risk employees and get the data you need to effectively create a strategy to keep your talent. Retain your top talent and avoid the huge costs related to employee turnover. Build leadership pipelines using our Succession Planning Assessment tool that includes a unique dashboard system making it easy to discover who is ready to move to the next level.